Hollywood Stars Jared Leto, George Clooney Put On Ukraine's "White List"
KIEV, Ukraine -- The list features international culture figures who supported Ukraine in its ongoing standoff with Russia. 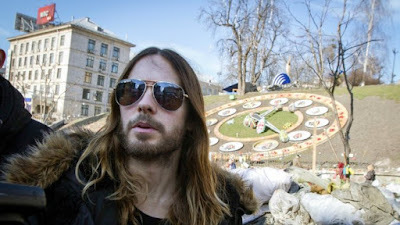 Jared Leto in Kiev's Independence Square in 2014. Ukraine has compiled a "white list" of Hollywood notables for their perceived support of the country as opposed to the "black list" of individuals siding with the Kremlin in the ongoing conflict between Ukraine and Russia. Tim Roth, George Clooney, Jared Leto, Milla Jovovich, Vera Farmiga and Arnold Schwarzenegger, alongside directors Wim Wenders and Pedro Almodovar have been put on the list of international culture figures entitled to special treatment thanks to their support for the country in its conflict with Russia. The list has been complied by Ukraine's culture ministry and currently features three dozen people from the U.S., Russia and other countries. The culture ministry's press service, which announced the list, quoted culture minister Vyacheslav Kyrylenko as saying that individuals put on the list should be entitled "to maximum support in their activities on Ukraine's territory." The aim of the list it to express gratitude to people standing by Ukraine at a difficult time for the country. Specifics of that support are yet to be worked out, though. All the individuals on the list have spoken out in support of Ukraine in its standoff with Russia, which began with Russia's annexation of the Crimean peninsula in March 2014 and continued as armed clashes with pro-Russian separatists progressed in East Ukraine. 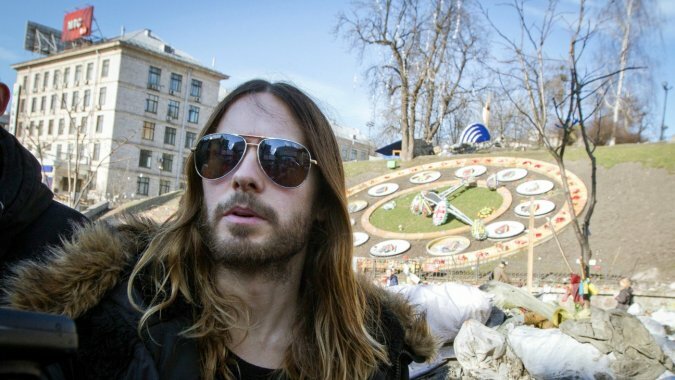 Leto voiced his support for Ukraine in its 2014 best supporting actor Oscar accepting speech. He later visited Kiev and performed there with his band. Schwarzenegger and Clooney released video messages supporting Ukrainians. Wenders and Almodovar has been active in an international campaign for Ukrainian director Oleg Sentsov, who was arrested by Russian security forces last year on terrorist charges. Earlier this month, Ukraine announced a black list of 117 Russian artists who are to be banned from entering Ukraine, which is reportedly to be increased to 600 people. The black list features, among others, French actor Gerard Depardieu, who was banned from entering Ukraine earlier this week.